Huang Jingyan (Statistics and Operations Research, Year 4) was selected by the Hong Kong X Foundation as the 50 most innovative projects under the FYP+ Supporting Scheme and awarded HK$20,000 start-up capital with his project named “Statistical Analysis of Light Detection and Ranging (LIDAR) using data mining methods” which aims to further enhance the efficiency and performance of the LIDAR Windshear Alerting System over runways by analysing the runway-specific LIDAR system installed by Hong Kong Observatory at the Hong Kong International Airport. 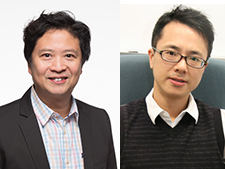 Dr Edmond Ma, Associate Professor (left), and Dr Ren Kangning, Assistant Professor (right) of the Department of Chemistry won the Gold Medal at the 46th International Exhibition of Inventions of Geneva for the project “Lead Detecting Device for Water”. 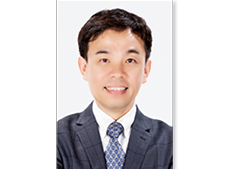 Professor Cheung Yiu Ming, Professor of the Department of Computer Science won the Gold Medal with Congratulations of Jury at the 46th International Exhibition of Inventions of Geneva for his project Lip-password: Double Security System for Identity Authentication”. 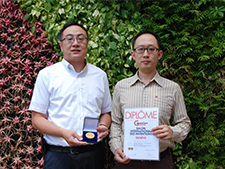 Professor Ken Yung, Associate Head of the Department of Biology (left) and Dr Jeffery Huang, Assistant Professor of the Department of Physics (right), won a Gold Medals with Congratulations of Jury at the 46th International Exhibition of Inventions of Geneva for their project “Medical Devices for Stem Cell Therapy”.